Lighting for theatrical productions tends to be in the form of cues – these are individual lighting states that are worked through in order from the start of the show to the end. There’s rarely any improvisation or modification of cues once the show is up and running. This is far more useful than a fully marked-up script. – Warm general wash (front light), splitting the stage into three areas across. No need for separation between upstage / downstage. – Tight spotlight on actor’s face – he stands upstage right, just on stage of the door. Using this information, the tech team can work out the lanterns / equipment that you need. AVOID being ultra-specific about particular pieces of equipment, without describing what it’s for in detail. The reason to avoid this kind of thing is that very often the tech team in a venue will know the best way to achieve the various effects you need for your show, and will be able to advise you, IF you give them the right information about what you actually NEED, not what you had last time you did the show in a completely different venue. Number the lighting cues sequentially, starting from 1. Write the cues in the following way: LX Q 1 GO (LX stands for Electrics, and nowadays means lighting; Q is the cue number. GO is the action word that means this is the exact point when the lighting change should happen). Don’t forget the house lights / preset. Very often the first state of the show (house lights, preset on stage) is numbered LX Cue 0.5 – this means the first actual CUE of the show is numbered ‘1’. 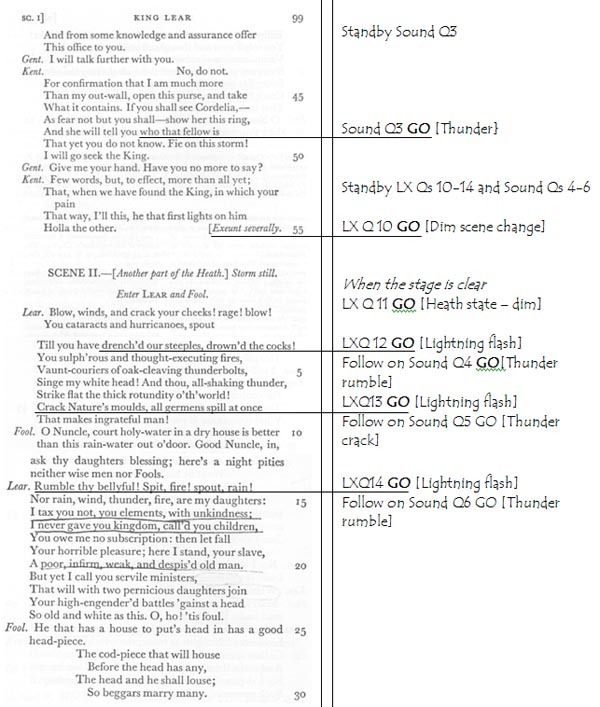 This is an example of how a script COULD be marked out – try to print it so that there is either a blank page on the right of the folder (assuming you / your stage manager is right-handed) OR allow a large right-hand margin. The Standby cues are usually marked in if you have a Deputy Stage Manager (DSM) cueing the show. See also Stage Management – Prompt Book for more on writing cues into a script. Lighting for bands or events requires you to create a number of ‘looks’ or palettes, which can be used as appropriate through the show. Lighting in this way is known as ‘busking’ – you’re effectively deciding on the lighting that is needed for each moment of the show as it happens. Obviously it’s rarely completely random – you talk through the looks you need with the band or organisers of the event, and your aim as lighting designer is to deliver these as accurately and sensitively as possible.